I haven’t wanted to do crap since getting back from Alaska last Monday. Well at least in the work sense. If it’s play outside, workout, go to the lake or sit by a pool, I’m all in. This happens to me every time I go on vacation and while Alaska wasn’t necessarily vacation it’s certainly hard to classify it as “work” at the same time. The fact that I pretty much couldn’t use my computer at all for 6 days while out there didn’t help either because once I disconnect (although I go down kicking and screaming), I find it incredibly hard to reconnect to work and/or the internet world. Sometimes I wish it was still like 1998 and dial up AOL email was still a novelty. The one (and just about only) thing I was actually able to accomplish last week were these grilled BBQ short ribs. Besides this though, I pretty much played hooky from work and haven’t really found much motivation since to get my act together either. Summer is just too damn short to spend time inside working! Can I get an amen? I never really thought to 1. even cook short ribs in the summer since they’re very much a winter meal in my head and 2. grill them. But, I was in the store stocking up on grass-fed local beef from the one place that carries it around here, saw these short ribs and decided to give them a go on the grill. Just like cooking them in a pot, the best method is low and slow. So while these aren’t a quick grilled summer meal, they don’t make your house any hotter by using the oven, they’re still super tender with that classic short rib fall-of-the-bone thing and full of summer BBQ flavor. 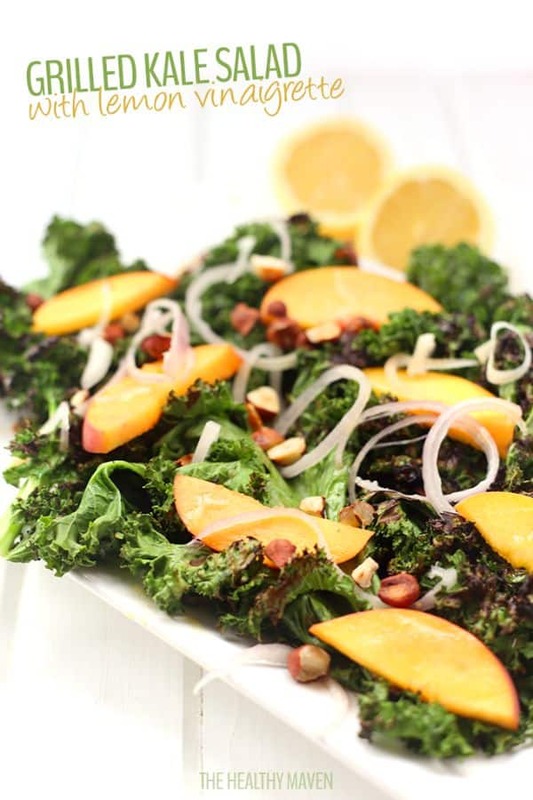 I’m teaming up today with my blogging lady friends to bring you another round of healthy paleo recipes. 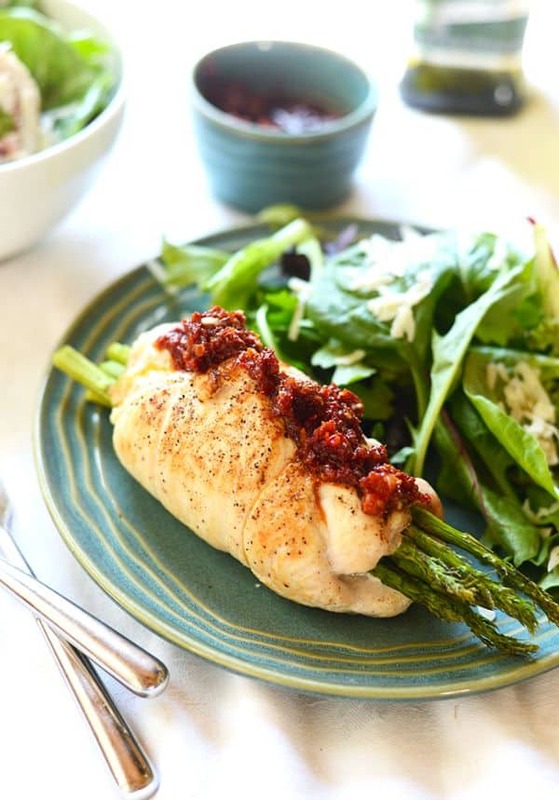 This month’s theme is grilling and whether you’re looking for dinner, salad or dessert, we’ve got you covered with this roundup! Check them all out below and click the links or pictures to get each recipe. 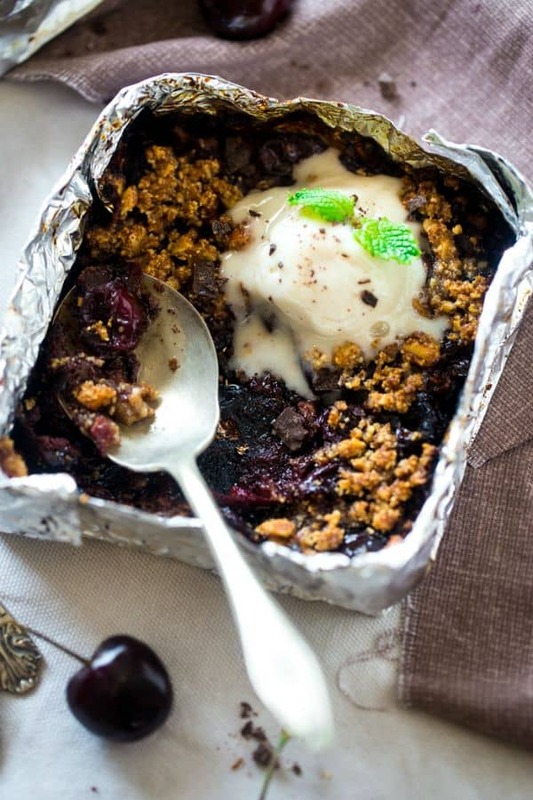 The perfect healthier Summer dessert! If you’ve never grilled bananas, you need to start with these! 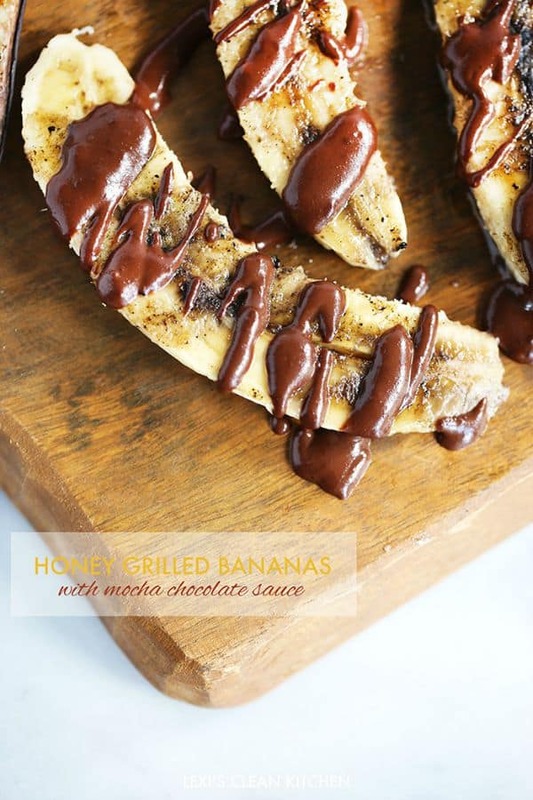 Lightly sweetened and topped with a flavorful chocolate sauce for the perfect grilled treat. And of course my grilled BBQ short ribs. Leave off the optional BBQ sauce for a paleo meal or make your own without the sugar you’ll find in pretty much any store bought variety. I personally love the combo of the dry rub and wet sauce for that finger lickin’ rib goodness so a little cane sugar doesn’t bother me, but you do you. 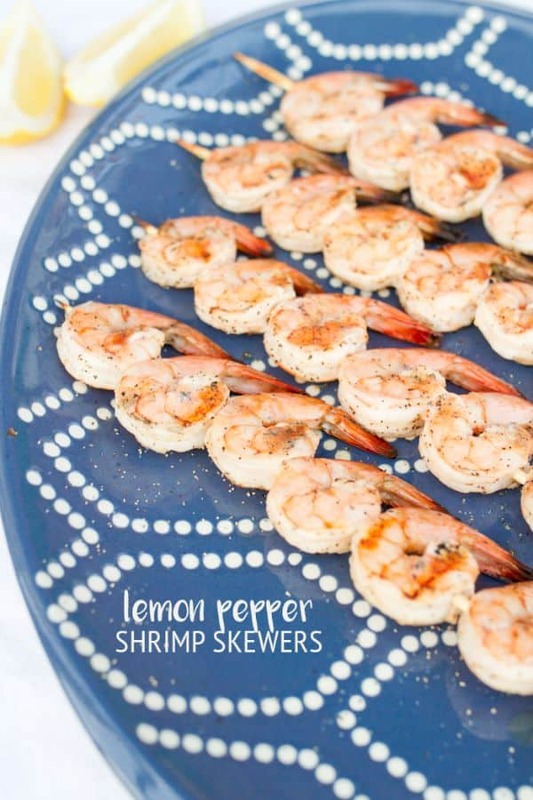 Don’t skip the grilled pineapple salsa either, so good! 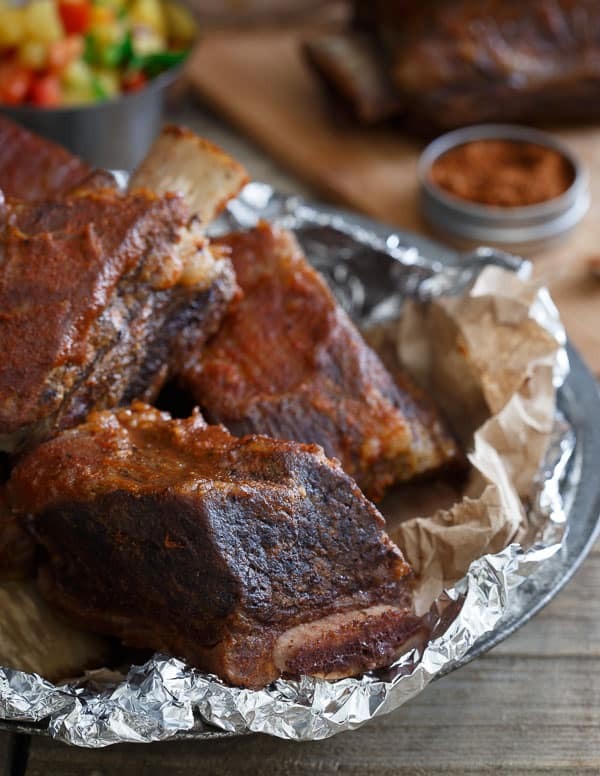 These grilled BBQ short ribs are covered in a smokey dry rub with an optional BBQ sauce slathered on at the end. 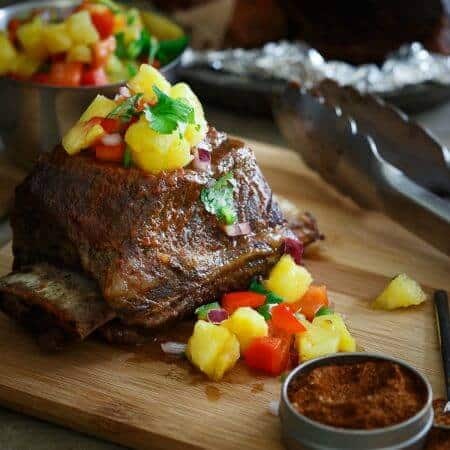 They're cooked low and slow on the grill for a tender meaty summer dinner and served with a fresh grilled pineapple salsa. Trim as much excess fat from the short ribs as possible and set aside. Combine the coconut sugar and spices in small bowl. Rub each short rib with the spice mixture until all sides are coated. Place in a dish, cover and let sit for 30 minutes to 1 hour. Preheat an outdoor grill to about 400 degrees leaving one burner off so that there is a place to cook the ribs over indirect heat. Place 2 ribs and 2 ice cubes on either side of the ribs on enough aluminum foil to fold into packets. Seal the packets on the sides and top leaving a little bit of air in the top to give the moisture a place to go while cooking. Repeat with remaining ribs. Place the foil packets on the grill over indirect heat and cook for about 2 hours or until tender. Carefully open the top of each packet and if using the BBQ sauce, brush on top of each short rib. Close the grill and continue cooking for another 10 minutes. Remove from grill and let sit for a few minutes before serving. Place the pineapple rings on the grill while the ribs cook. Cook for about 5 minutes per side until grill marks appear and pineapple starts to caramelize. Remove from grill and chop. Add the pineapple to a bowl with the remaining ingredients and toss together. 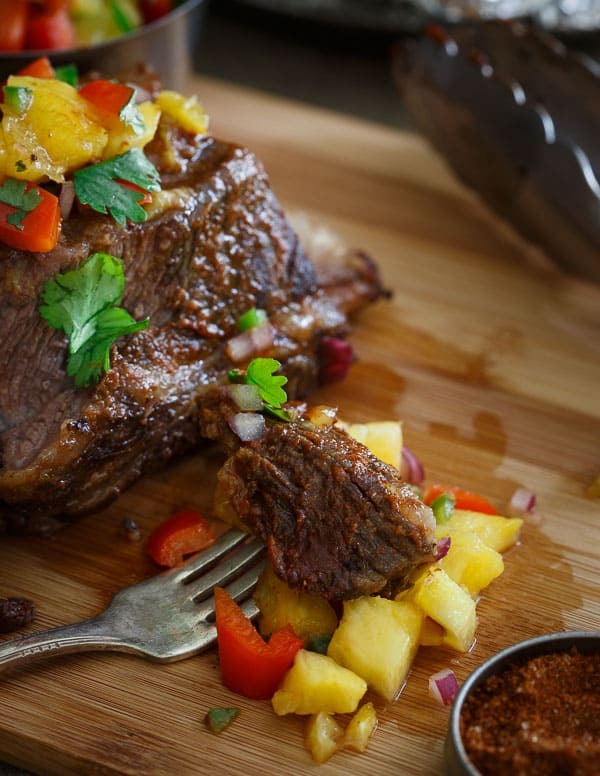 Serve with the cooked short ribs. 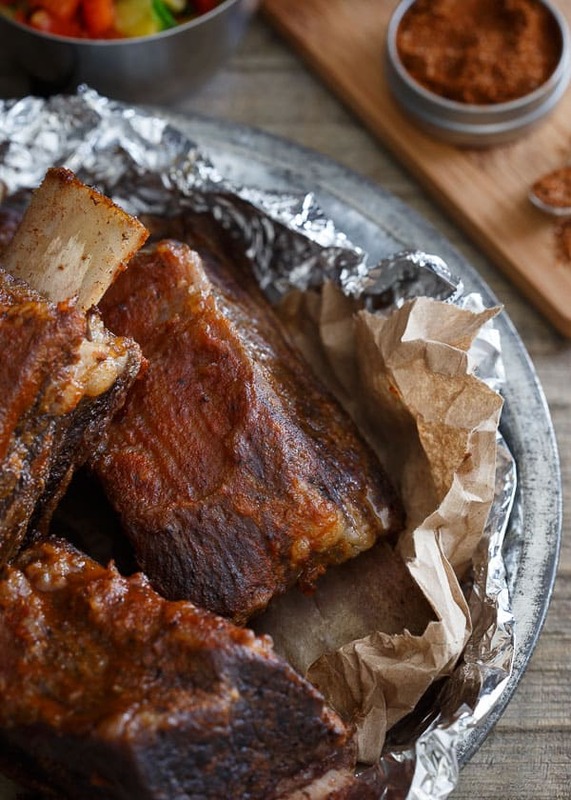 LOVE short ribs and these look sooooo good! Gina, your short rips look AMAZING. 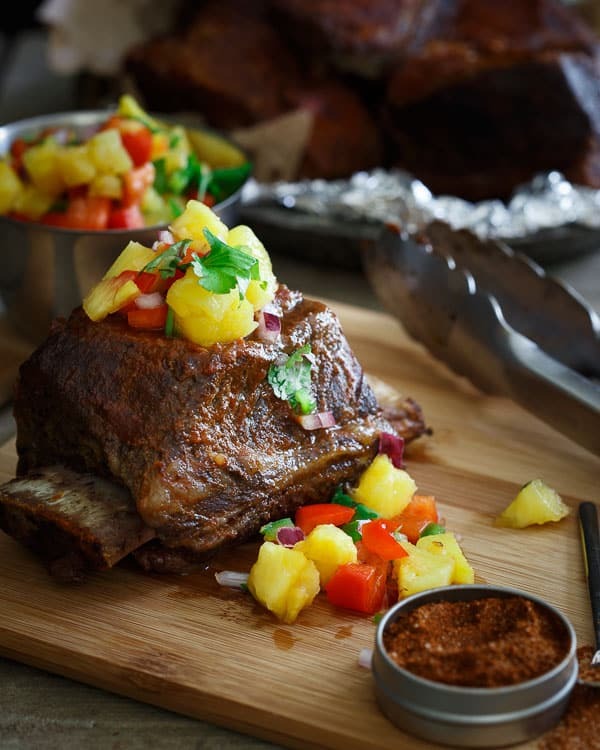 Love that it’s topped with pineapple salsa, too! You just got back from Alaska? I went earlier this month and it was so much fun! Hope you had a great time, too! I wouldn’t want to jump back to work after a week in Alaska either – but for these short ribs I could pull it all together. They are STUNNING!! I CANNOT wait to make these!!! Picked up short ribs from short ribs from my market and it’s GOING DOWN!!! I am wishing for a summer barbecue and some of these grilled ribs right now! Shame it’s Winter here in Australia but I do have to try this recipe at some stage. Pinned! I can totally relate to the difficulty of re-entry. The first inn we stayed in in Alaska didn’t have wifi (or rather we didn’t know the password for the first day… ‘course my son was sick, so I didn’t have much time to try to figure it all out). And I thought I would go nuts. Once I embraced the whole “people know you’re in Alaska. Your work is covered” I embraced it and then it stunk to have to reconnect. While I don’t necessarily crave AOL dial up :) I do sometimes crave a time when my computer was at an office and that’s the only time I saw it or email. I’ve actually never cooked my own short ribs! But I love ordering them, so i totally need to try these! Pinned!